How big an influence has Tapper—the 1980s video game in which a mustachioed barkeep must keep a tavern full of barflies well-lubricated—had on my world view? A beer stand at the Oakland Coliseum that I frequent on game day features an inelegant set-up where the server scurries back and forth between the counter and the tap, trying to placate an ever-growing queue of customers. “Whoever came up with this design has clearly never played Tapper,” I will say to anyone who will listen to me, which, I’m sure you will understand by now, is hardly anyone. So I’m right in the wheelhouse for Tapper World Tour, a 21st century revival of the arcade classic available in separate iPhone and iPad versions. The basic gameplay is the same as it was in the Reagan era—you control a bartender who has to serve up drinks to a seemingly unending line of patrons inching their way down the bar. Occasionally, they’ll leave tips, which you’ll want to collect. They’ll also send back their empties, which you have to collect. If too many customers go thirsty or too many glasses gets smashed, your game comes to a humiliating end. Warner Bros. has livened things up with this iOS version, starting with the graphics. Instead of the pixelated images of the 1980s, the updated Tapper features cartoonish animations created by Don Bluth. Then there’s the World Tour aspect of the game—you work your way through bars across the Americas, each one with their own unique drinks and decor. It’s a clever way to keep the gameplay fresh as you advance through Tapper’s different levels. Drink It In: Tapper World Tour revives the ’80s classic Tapper with more lively animated graphics. Tapper World Tour offers two different modes. In story mode, you work your way through different levels at bars in a multitude of cities, unlocking new challenges as you go. (I count a total of 40 levels across 11 cities; the game’s App Store page promises more expert levels once I complete the story mode.) In Unending Shift, you work the bar in one of your unlocked cities, serving patrons and racking up points until you run out of lives. Tapper World Tour also keeps things hopping with a series of power-ups aimed at helping you keep your customers properly liquored up. A pair of souped-up running shoes let you retrieve empty glasses and tips more quickly. Another power-up lets you ignore orders for specific libations without consequence while a third can serve an entire bar full of tipplers all at one time. You earn power-ups as you advance through the game, and you can deploy them when you’ve served a certain amount of customers without mishap. Again, it’s an enjoyable way of keeping things lively. At Your Service: Not only does Tapper World Tour let you choose between a male and female bartender, you can also opt for virtual buttons (seen in the lower corners of the game) instead of touch controls. The iPhone and iPad versions of Tapper World Tour are virtually identical, though the latter is able to cram in more countertops on some challenges because of the tablet’s more expansive screen. And it’s that screen size that ultimately makes the game feel like a better fit on the iPad. Tapper World Tour HD fits perfectly on the iPad’s screen, giving you plenty of space for surveying the scene. On the iPhone and iPod touch, things feel a little too constricted, though the game is certainly playable. There’s room for improvement, though. As nice as the animations are, they could do a better job of letting you know when customers are getting impatient about their drink orders—right now, they just disappear in a puff of smoke, which is hard to spot amid all the frenzied activity in Tapper World Tour. You can check your high scores against others using Apple’s Game Center app, but I couldn’t find a way to check my scores on a given level against my personal best. (Tapper World Tour uses a star system to rate your performance that will be familiar to Angry Birds aficionados, but your high score on a given level is lost to the vagaries of time.) Finally, Tapper World Tour HD spontaneously quit more than a few times in my testing—once when I was about to complete a very difficult level that I’ve been stuck on for some time. It’s enough to drive a man to drink. Still, this is an ideal app for casual gamers, particularly 1980s arcade denizens looking to catch up with an old favorite. You can play for a few moments at a time and put the game down at your convenience. 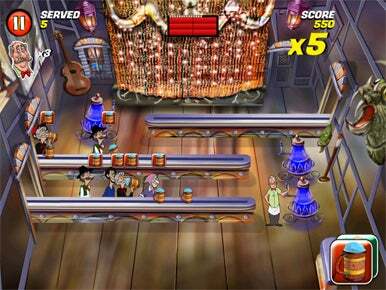 But Tapper World Tour offers enough of a challenge that, as with the bar patrons in the game’s more difficult levels, will keep you coming back for more.